Information about Municipal Separate Storm Sewer System (MS4) Permit. View the list of MS4 publications. Protection of the Rio Grande and improving our storm water quality is of paramount importance to the City of Albuquerque and a priority for the citizens that we serve. As a result the City has applied for and received a Watershed Based Municipal Separate Storm Sewer System (MS4) Permit. The City of Albuquerque and its co-permittees are currently regulated by Environmental Protection Agency's (EPA) National Pollutant Discharge and Elimination System (NPDES) through the Watershed Based MS4 Permit. The City and its co-permitees received their first permit in 2003. The first five-year permit expired at the end of November 2008, the second MS4 permit and was replaced by the Watershed Based MS4 Permit in December 2014. Under the new permit there are fourteen (14) co-permitees. The EPA believes that a WBP permit approach is more beneficial when it comes to enhancing the water quality in the Middle Rio Grande Watershed. Public Education and Outreach on Storm Water Impacts: Intended to educate the public of the potential for pollution and the benefits of improving the water quality in the Rio Grande. Public Involvement/Participation: Intended to identify various opportunities for the public to get involved in improving the water quality in the Rio Grande. Illicit Discharge Detection and Elimination: Program to find and eliminate non-storm water discharges that are sources of pollution that are harmful to the Rio Grande habitat. Construction Site Storm Water Runoff Control/ Industrial & High Risk Runoff Management: Monitor and minimize the release of pollutants, sediment, trash, and debris from construction sites during construction activities. Post-Construction Storm Water Management in New Development and Redevelopment including the implementation of Low Impact Development (LID) practices: Implement LID practices in an effort to reduce the amount of storm water runoff that can leave a site and enter the City's storm drainage system. Pollution Prevention/Good Housekeeping for Municipal Operations: Program to ensure that City facilities storm water controls/Best Management Practices (BMPs) are maintained and inspected on a regular basis. In addition, this program provides training to City employees on the best practices for daily maintenance and operations activities to minimize the introduction of various pollutants into the City's storm drain system. In an effort to receive public input and share information about the City's MS4 permit a Citizen Blue Ribbon Committee was formed through the Mid-region Council of Governments (MRCOG). The Purpose of Committee was to discuss issues regarding compliance with the permit under the federal Clean Water Act, and to formulate recommendations for consideration by the MS4 co-permittees in order to effectively implement the Albuquerque stormwater management program in conformance with the EPA's six minimum measures. Storm Water Management Section also provides guidance and training to local engineers, planners and contractors in the planning and implementation of storm water quality control measures for construction projects installed within the City of Albuquerque. 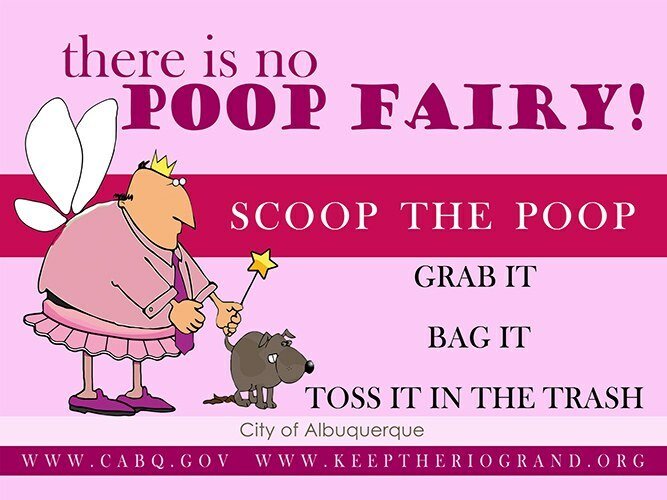 View images for the City of Albuquerque's Poop Fairy campaign. Do you think a fairy will wave a magic wand? You are responsible for cleaing up your pet's waste. The Poop Fairy image and campaign materials were provided by Greenville County Soil and Water Conservation District in South Carolina. 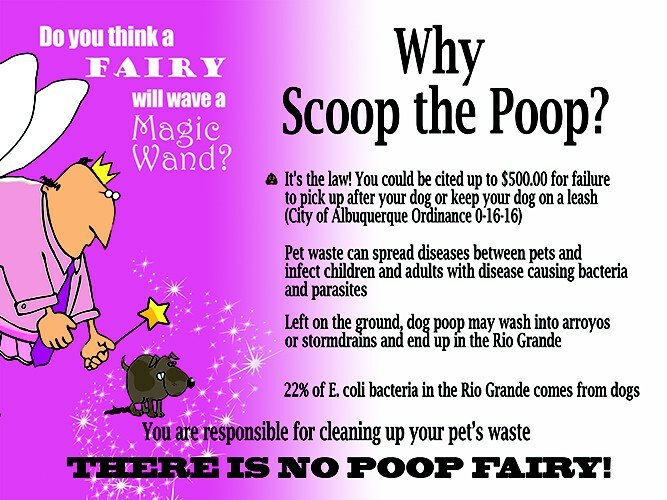 Based on a Colorado Scoop the Poop effort, GCSWCD's campaign with the humorous fairy and tag line launched in 2011 and has continued to achieve national recognition. For information, visit the Poop Fairy website. If you would like a yard sign, please email [email protected]. Download the Fiscal 2017 MS4 Annual Report. The SWPP was developed to meet the requirements of both the City's Municipal Separate Storm Sewer Permit and the EPA's Multi-Sector General Permit for Storm Water Discharges associated with Industrial Activity.View the plans. View information about the National Pollutant Discharge Elimination System Manual.